2010 has been a nightmarishly dynamic year for Bulgarian education and research. Minister of Education Sergei Ignatov was hyperactive in trying to launch on many fronts the much-desired reform of education. Vice-PM and Minister of Finance Simeon Djankov was the other main cabinet player in the game, voicing his own opinions and naturally determining the parameters of funding. Albeit a somewhat external matter, funding turned out to be a key issue in 2010's education debate. In an already underfunded system that in Bulgaria has been traditionally state-supported, looming budget cuts all through the year seemed to raise new problems. The debate was the usual one: the cabinet argued that it is harmful to pour down money in unreformed and ineffective institutions, especially given the introduction of austerity measures, while universities and research institutions argued that less money would stifle their work, as well as that education and research should be a country's strategic priority during times of crisis. The numbers: The 2009 state budget mandated BGN 420 M for the state university system and BGN 96 M for the Bulgarian Academy of Sciences. The initial 2010 state budget previewed BGN 380 M for universities and BGN 75 M for BAS. The 2010 budget as revised in July reduced those amounts to BGN 308 M and 60 M, respectively. That is, a 27% cut for universities and an unbelievable 38% cut for the Academy. Critics pointed out that at the same time the budgets for institutions such as the Ministry of Interior had been raised to staggering heights. To boot, Minister of Education Ignatov advanced his idea for state funding for private educational institutions, both schools and universities. Many argued that the idea is outlandish given scarce funds for education in general, but it nonetheless has received support from PM Boyko Borisov. One of the things to watch out in 2011 is whether and how it will be actualized. This move is part of the larger philosophy of Ignatov for the area, which involves introducing a so-called "market principle" in education. Universities and schools have to compete amongst each other, argues the minister – and we must not distort the market by allowing some institutions to be sponsored by the state, while others (namely the private ones) to remain working using own funds. It is to be noted that Sergei Ignatov is a former rector of the New Bulgarian University, the country's major and most prestigious private institution of higher learning, and has maintained ties with NBU circles. The reform of education in 2010 concentrated around universities. Ignatov had vowed to draft completely new laws on the acquisition of academic degrees and on higher learning. A third new law on primary education is scheduled to be developed in 2011. The law on higher education project was scrapped as it turned out neither universities nor Ministry had a clear concept about the new law. The act on academic degrees on the other hand was pushed through and underwent a remarkable Odyssey of debate in Parliament, enactment, challenge at the Constitutional Court and then amendment in the very end of the year. The undoubtedly significant change introduced by the new law is the liberalization and decentralization of the procedures for acquiring degrees, which up to 2010 were conducted by a state commission appointed by Bulgaria's PM, the so-called Higher Attestation Commission. The completely new Law on the Development of Academic Staff adopted in May abolished the HAC and let universities make their own rules when appointing professors and awarding doctorates. Critics argued that the radical liberalization would lead to a mushrooming of fake or random professorships across the country. Others criticized the legal adequacy of the act, arguing that it left too much leeway for interpretation and specifications by additional rules and decrees. At any rate Bulgaria's Constitutional Court considered so when in October it repealed more than a dozen provisions of the new act. In particular, it deemed unconstitutional the fact that the law gave to the government the power to arrange by decree matters that should be legislatively settled. It also uncharacteristically argued that as a whole the law was badly formulated and lacked a clear conception of its subject matter. This effective mauling rendered the fresh new act unenforceable, something that did not discourage Ignatov's resolve. The Ministry and MPs worked hard at legislative amendments to patch up the holes in the text, which were passed in Parliament mid-December. It remains for 2011 to show how the new act will function. Provisions in the new act on academic degrees were found to be greatly similar to internal regulations at New Bulgarian University, which only gave academic circles additional grounds to believe that Ignatov is bent on refashioning the higher education system according to the NBU model. In particular, that would mean splitting the financial and academic management of institutions, which on the pro side could optimize efficiency while on the contra side might harm fundamental or strategically important disciplines which are by default not economically profitable. Suspicions about an attack against traditional state universities were intensified when Ignatov supported various negative statements about the Sofia University, Bulgaria's oldest and most prestigious, questioning both the quality of education there, and the cleanliness of its financial transactions. Ignatov was enthusiastic supporter of an extensive prosecutor's investigation of the University during the fall for alleged financial abuses in the Faculty of Law. The investigation did not uncover any irregularities. When we turn to the Bulgarian Academy of Sciences, the country's oldest, most extensive and most productive research institution, we can easily speak of a directed attack from the government. In addition to the aforementioned drastic budget cuts, there was already talk in 2009 that the Academy is useless and could well be disbanded. Here again emerges the figure of finmin Simeon Djankov, who end of 2009 had coined the unusual phrase "feudal dotards" to refer to BAS workers. The situation motivated some of the most large-scale street protests the Borisov GERB cabinet has this far seen, with thousands of researchers going out on the streets of capital Sofia in May and then again through the fall. Compared with them, ongoing protests of university students and faculty were unfortunately small and ill-focused. Cabinet initially reacted by stepping back, with PM Boyko Borisov assuring he had no intentions to close down the Academy or sell out its properties, as Djankov had clearly suggested. But then in the fall, Borisov staged a well-coordinated public operation in which he announced plans to demolish the central administration of BAS and to split the Academy into self-standing institutes under the jurisdiction of the Ministry of Education. That move was seen as a clear step toward the actual dismantling of the Academy, with institutes being left at the mercy of civil servants not only as far as management and funding, but also as far as their existence is concerned. 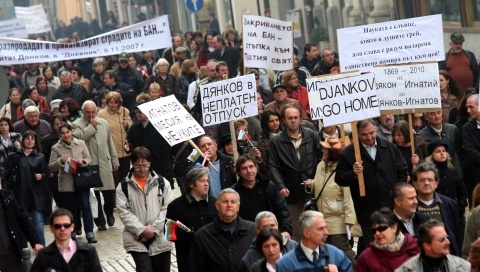 It provoked the ire of not only researchers, but also of significant parts of the Bulgarian population and media. The actual legislative amendment to the Law on BAS was tabled in November by a GERB backbencher in Parliament. It is currently under discussion at the Education Committee, under an unprecedented opposition of all parliamentary groups excluding GERB, but including nationalist Ataka and rightist Blue Coalition, who have this far seconded the ruling party. Alternative legislative amendments have also been tabled, but although less radical, at least one of them significantly diminishes the autonomy of the Academy. At the same time, over the spring BAS had an international review and audit completed, which confirmed that the level of work done in the Academy is very good and issued recommendations for bettering efficiency. Accordingly, BAS effected a large-scale internal reform, reducing the number of institutes from 69 to 42 and making important optimizations in administration and cuts in spending. Indignant mail from international research institutions reacting to the government's policy is flooding the inboxes of BAS and cabinet offices as we speak. A petition in support of the academy has thus far been signed by more than 7,000 scientists from across the world, including six Nobel laureates and five holders of the mathematics Fields Medal, as well as Bulgarian researchers working abroad.